Some days I need to sew, I'm certain I've mentioned that here more than once before. I sew for lots of reasons, because I prefer the fit of clothes I make to that of ready to wear, because I like having a wardrobe of clothes that are not like anyone elses, because I like the challenge and the process of making, and often because it is like a meditation, it calms my spirit, and eases my soul. Those are the days I'm so very glad I was taught well, and can make up simple garments without thinking. Those are the days I most need to feel the satisfaction of blades cutting through fabric, and that comforting hum of the sewing machine. Yesterday was one of those days. This time of year is full of ghosts, bittersweet memories and too much sadness. I don't run away from the sad, it needs to be sat with sometimes, and I can do that better if I just sew. I'd been thinking of making the Colette Sorbetto for a while. 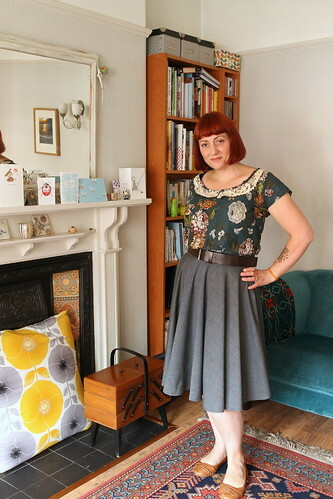 I had a small piece of the gorgeous cotton lawn I used last summer for my Hawthorn dress and thought I could squeeze a simple blouse out of it, luckily there was enough to also add sleeves. 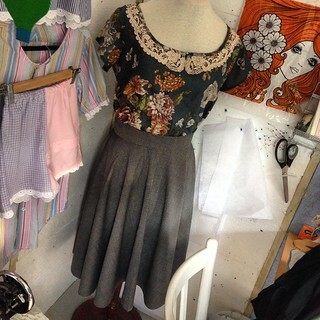 I cut out a size 12, did my usual full bust adjustment (FBA), and removed the centre pleat. 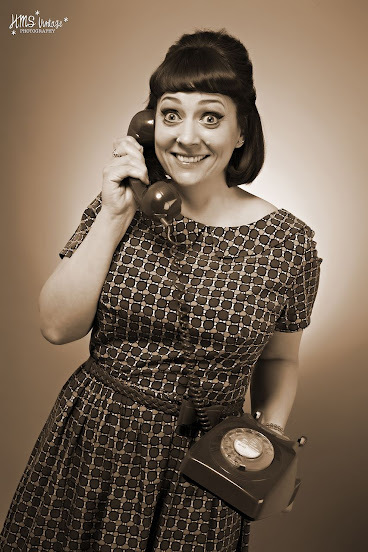 (If I make another I think I will add the pleat back in and make a faux placket, or perhaps pin tucks instead of the pleat. The lace collar was salvaged from a ready to wear blouse I've had for several years and was getting rather tatty. 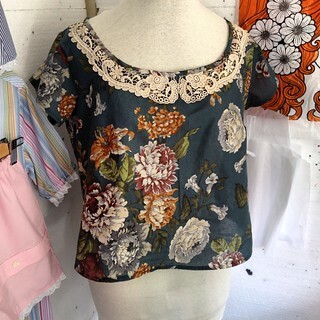 I used bias binding made from the blouse fabric to finish the neckline. 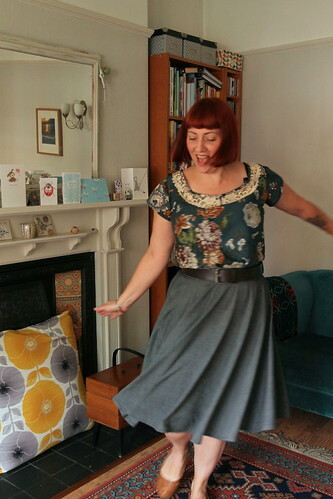 I whipped up a simple circle skirt with a wide waistband, and left it to hang overnight in my shed. 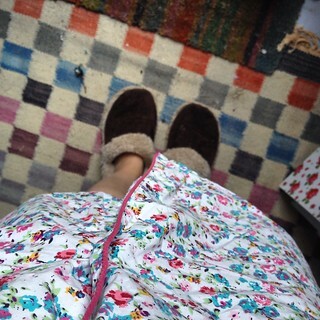 This morning I nipped out there in my slippers and nightie to hem the skirt so I could wear the whole outfit today. I'm really pleased with both items. 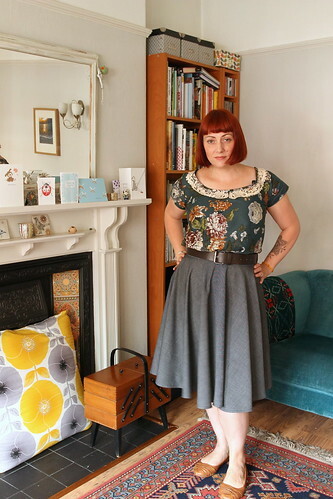 How great is it that sewing helps heal my mood and I get something lovely to wear too? I know I can't be alone feeling this way, I'd love to hear from others out there who use sewing as their safe place. 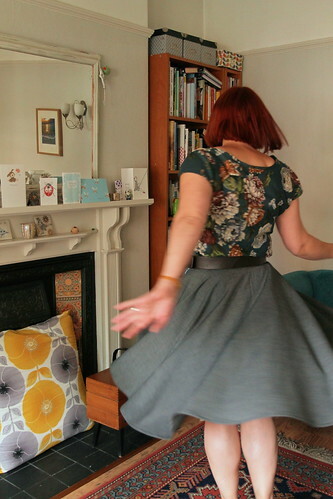 Of course a circle skirt demands a certain amount of twirling too! I adore your new outfit! I would love to snap up some of that cotton lawn - any idea who makes it? Sewing is definitely therapeutic and meditative for me. There have been (and still are) times when it both soothes and rejuvenates my soul. Sending you happy thoughts and hugs during this sad time. It has kept me going! I lost my son eight years and sewing has helped me so much. 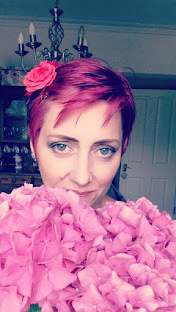 It has given me something positive to fill my head with, I do more planning than sewing! It has helped to put some purpose back in my life. Lovely outfit. Shani, I love that you have shared that snippet here, thank you. You made me smile.